Everyone cannot be a receptionist because you should be patient to be a receptionist. Some people have self confidence to be a receptionist; thus, they will send their resume to the relevant agents by email or in person. They would like to improve themselves in this department because of possession of communication skills, organization skills and any other skills that a receptionist requires. The employers open the positions for receptionist, and would like to determine the candidates by eliminating on the base of requirements and skills. Thus, each candidate of receptionist should write a cover letter that is a summary of candidates’ career life in order to mention about skills and experiences. However, the candidate must pay attention on some basic points to prepare it. Since everything has a rule to shape. Therefore, this passage mentions about how the receptionist cover letter should be, what points you should focus to write it. To begin with, you should write your name, your address, city, phone number and email address on the left top of the paper. This part includes your communication information. You must be careful about writing this part correctly. At the bottom of this part, you should write the date of this document. You should write a part that gives much information about employer’s name, address, City. You should make a control over this part in order to reach it right address. You can write the person’s name that you must know. That is to say, you should write his or her name to salute the employer. For instance, you can say to begin the letter Dear Mr. Black. That is to say, you should make a mini research to learn the employers’ names. You must make a paragraph to depict why you are writing this letter along with attractive skills you have. For instance, I am writing this letter for the open position in your company. I have self confidence because of my enough experience along with my organizational skills. I think that I might be a suitable candidate for this position. This part should emphasize your experiences you have had. For instance, I have been working as a receptionist in X company. Besides, I have multitasking capacity not only to take notes of customers but also to answer on the phone. I also would like to take place in the larger companies like yours. You can also give some details about your skills. For instance, I have strong skills in communicating and writing reports. And I can easily follow the arrangements, dates and customers’ expectations. Furthermore, I can greet numerous people simultaneously, which is my profession. It doesn’t give me any problems. I can easily deal with all the crowded groups. This part should include your basic knowledge about technology, and its programs. For instance, you can add some details such as your knowledge of Microsoft Office, Microsoft Word. Besides, it would be effective way to mention about training in this part. In this part, you should tell about your suitability for the open position. You should utter that you are pretty candidate for job posting. Furthermore, you should say that you are waiting for the answer as soon as possible by wishing an interview to talk in person. In the end, you can finish the letter yours faithfully, sincerely and below it, there should be your signature and name. Read Instructions: Please read the instructions in the job posting. Since some companies would like to attach the cover letter to the email address, while the others might wish the cover letter and resume in person. You should read it at least twice. Thus, be careful to do they want. Relevant Skills to Requirements: You should be careful about writing skills that are relevant to the requirements. That is to say, you should highlight the skills that match with the job postings. It is important to mention about these skills in the job posting. Share Some Anecdote: This is important to share your experiences. You can also give some examples of your career life to show skills and problem solving skills or any other. For instance, you can explain how you were able to persuade difficult customer by sorting the problem out. This will be effective to get the job you wish in an easy way. Make Controls: Do and do the controls over the document you write. It should not have spelling mistakes or letter mistakes or structure mistakes. It should be excellent with each part. Besides, it should have great meaning to achieve your goals easily. Then it might bring about the voice of other companies. As a receptionist, you should give importance to the details along with detail oriented ability. Thus the employers will anticipate how importance you have had given to write this document. 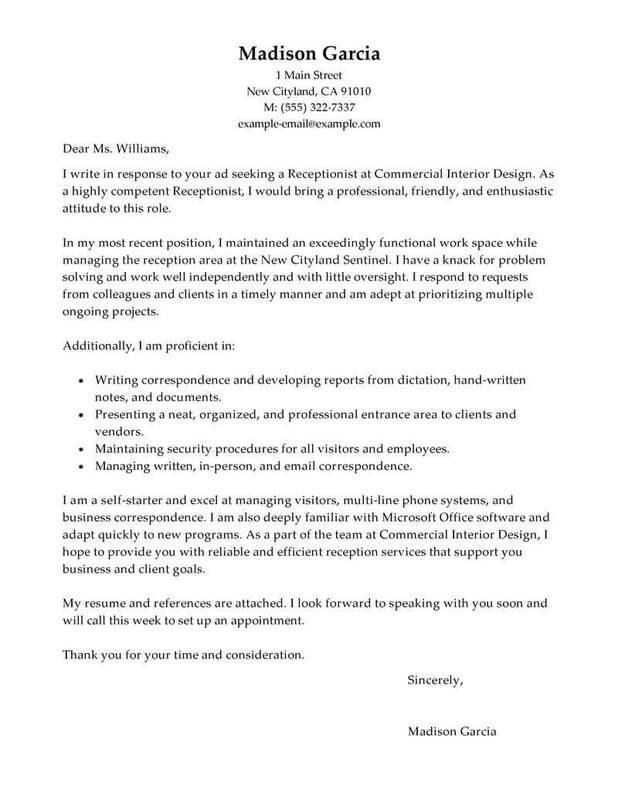 Consequently, after reading this passage, you can understand how to write a cover letter for receptionist. These details illuminate your question marks in your brain. Besides, it gives you some ideas about how to create a perfect cover letter in order to eliminate the other candidates. It will help you to get the job position as a receptionist as soon as possible. Don’t hesitate to have self confidence to apply for the open positions; thus, your dreams will come true.